Katie Derham presents, with live music from pianist Mariam Batsashvili, and singers Justina Gringyte and Dmytro Popov with pianist Iain Burnside. Katie Derham presents a lively mix of music, conversation and arts news. Her guests include singers Justina Gringytė and Dmytro Popov, who perform live with pianist Iain Burnside before a concert of Russian Song at Wigmore Hall in London. 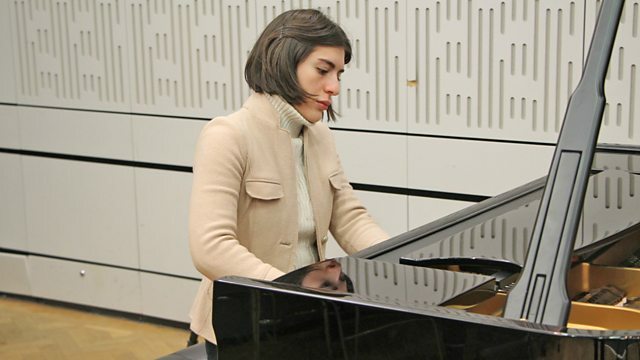 Pianist Mariam Batsashvili also performs live before heading to Northampton and Cambridge where she is performing with the Royal Philharmonic Orchestra. Plus an interview with conductor John Lubbock, whose Orchestra of St John's gives a special 50th anniversary concert at St John's Smith Square on Friday. Director: Vlad Weverberg. Ensemble: Terra Nova. Performer: Dmytro Popov. Performer: Iain Burnside. Conductor: John Lubbock. Orchestra: Orchestra of St John's. Choir: Osj Voices. Orchestra: The Orchestra of St. John's, Smith Square. Conductor: John Lubbock. Performer: Justina Gringytė. Performer: Iain Burnside. Performer: Shunske Sato. Orchestra: Il Pomo d’Oro. Performer: Gabriela Swallow. Performer: Richard Bonynge. Singer: Sally Silver. Conductor: Maxim Emelyanychev. Orchestra: Nizhny Novgorod Soloists Chamber Orchestra. J.S. Bach: Cello Suites: Paul Tortelier. Performer: Peter Gregson. Performer: Richard Harwood. Performer: Reinaud Ford. Performer: Tim Lowe. Performer: Ben Chappell. Performer: Katherine Jenkinson. Music Arranger: Peter Gregson. Singer: Riccardo Zanellato. Orchestra: Chorus and Orchestra of Teatro alla Scala. Conductor: Riccardo Chailly. Conductor: Roberto Forés Veses. Orchestra: Orchestre d’Auvergne.